Gray Family Chiropractic offers a unique form of electrical muscle stimulation, the TheraStim to our patients in order to help facilitate the healing process. TheraStim is a direct current electrotherapy modality that is utilized for reducing pain, muscle spasms, increasing and restoring range of motion, and increasing circulation to the affected areas. TheraStim is a neuromuscular stimulator that introduces electrical signals to the body through conductive electrode pads to provide relief for a variety of health complaints. 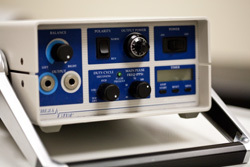 It’s unique waveform and use of direct current allows it to get deeper into injured tissues than traditional electrical muscle stimulators or Tens Units without surface pain or damage. TheraStim is a distinctive breakthrough in the treatment of soft tissue rehabilitation. When disease or injuries occur, there is an electrical charge formed in the affected deep soft tissue. The affected charged area creates an environment that stimulates the production of Bradykinin, which is a highly potent chemical produced by the body as a result of tissue damage. Bradykinin is a major factor in developing edema, pain and muscle spasms. When you introduce an electrical current that can penetrate deep enough like the TheraStim, you can eliminate the charge of injury and prevent the continued formation of Bradykinin and thus greatly reduce the effects of trauma. Results are usually immediate and dramatic because it shortens healing time and penetrates deep enough into soft tissue to dissipate the charge of injury and reestablish intercellular communication. TheraStim is an extremely effective form of electrotherapy to alleviate chronic pain resulting from old injuries because it breaks down scar tissue to release stored charges of injury and then allows the tissue to return to normal. Cervical Spasms, Lumbar Radiculopathy/Sciatica, Rotator Cuff Injuries, Frozen Shoulder, Carpal Tunnel, Torticollis, Epicondylitis, Plantar Fascitis, Wrist Pain, Injuries of Ankle, Hamstring/ Calf Strain, Knee Injuries, Bursitis, and many others. Typically treatments require about 15 minutes each and the number of treatments required depends on the patient’s symptoms and the treatment plan selected by the doctor. During a TheraStim treatment, patients may be asked to move the area of complaint in order to isolate a specific muscle or group of muscles.